Understanding Nitrous & Q/A Please Read Before Posting ! Thread: Understanding Nitrous & Q/A Please Read Before Posting ! Great information people should read and understand before jumping the gun. A: Nitrous Oxide is a gas,but under pressure in a closed vessel,it is a liquid.Nitrous Oxide was first discovered in 1772 by Joseph Priestly,an English scientist. Nitrous Oxide's uses were not found until many years later when it was discovered it was a good anesthetic for medical use. Nitrous Oxide molecules consist of two nitrogen and one oxygen atom. In this molecule,oxygen accounts for 33% of the molecule and 36% of the molecule weight,compared to 23% content in the air we breathe. If you used pure gaseous Nitrous Oxide in your motor,you would gain about 40% more hp because of the increased oxygen content. Nitrous really shines when it is a liquid,it takes up much less space than the gas,plus it "cools" the intake mixture when it is injected. Nitrous takes up 8.7 cubic feet per pound as a gas at 70 degrees farenheight; at a liquid state you can stick 10.56 lbs into .133 cubic feet, that is a lot denser. Nitrous adds power by adding extra oxygen in a compact form into an engine. Of course,to combust this extra oxygen you need a corresponding amount of extra fuel to accomplish this. Nitrous also cools down the intake charge,making it denser,thereby allowing more molecules per cylinder-making more power. There is no limit in how much liquid Nitrous Oxide you can get into a motor,but the motor itself can only take so much stress before it breaks something. Because nitrous increases cylinder pressure-a product of stuffing more oxygen into a cylinder,rods usually bend before anything else breaks. Running a Nitrous engine lean will cause "hot spots" on the pistons that may destroy them in a few short seconds. Nitrous pumps up the torque curve immensely,this is how it adds more power to an engine. It also keeps this added torque to the power peak,increasing hp immensely also. Nitrous kits are easy to install and service,but they need careful tuning and maintainence in order to work properly and not cause any premature engine problems/failures. You have to pay strict attention to the instructions included in a kit,as some kits differ from others. A: It all depends on the application. A "wet" kit is ideal for both normally aspirated applications as well as forced induction applications. It can require a little bit more installation time than a "dry" kit, but is easier to tune if greater than stock HP settings are to be experimented with. 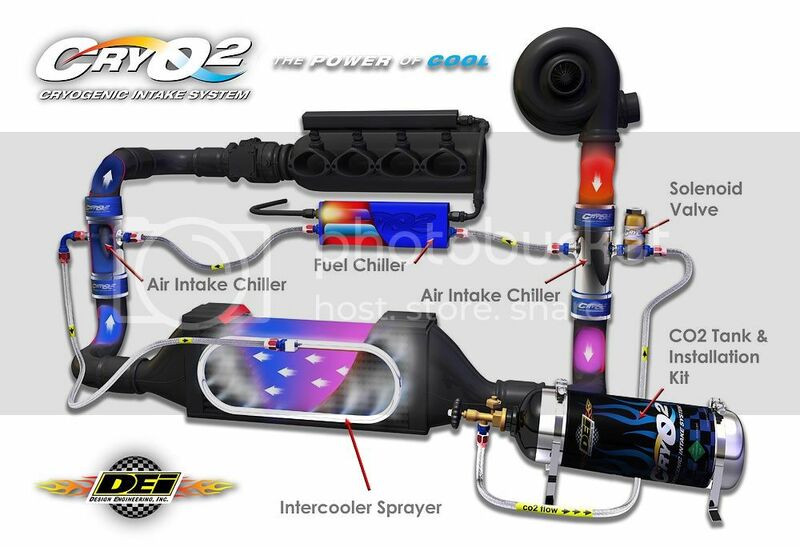 A "dry" kit is excellent for normally aspirated combinations that have a return style fuel system. They are very easy to install and are a great "first time" nitrous system. It is not recommended that "dry" systems be used on forced induction engines. Wet > A wet direct port system injects both Nitrous and Fuel through the nozzle into each intake runner. You will adjust your air fuel to each runner by tuning with the fuel jets. Dry >A dry direct port system injects nitrous only into each intake runner through the nozzle. The extra needed fuel is added separately through the fuel injectors. With a dry direct port system you can only adjust each individual cylinders air fuel if you have after market tuning software that will able you to change the fuel flow to each injector. Individual Cylinder tuning- Since a direct port places a nozzle into each intake runner you will have the ability to individually tune a cylinder that may be running richer or leaner than the others. You can richen or lean each cylinder by simply changing out the fuel jet in the nozzle. You have the ability of having a more precise tune up! Better Flow Atomization- Since a direct port places a nozzle in each individual intake runner you have the ability of spraying higher HP shots and keeping an even flow to each cylinder. Cost- Since a direct port system consists of more components there is an added cost for the system. Labor- Installing a direct port system is much more labor intensive. It requires removing the intake manifold, drilling and taping the intake manifold and plumbing the nitrous system onto the manifold. Tuning- Since a direct port places a nozzle into each intake runner you have more jets to swap in the event of a jet change. Behind fuel,timing is the most important area of Nitrous use to understand and follow. To get maximum power from a naturally aspirated or forced induction motor,you run the timing as high as detonation allows-you get max power there. By using better gas,you can put in more timing and get more power. Nitrous doesn't work that way. You must retard the timing when using Nitrous. Why? Because it pumps up cylinder pressure so much that detonation may occur,resulting usually in broken pistons and bent rods. You definitely don't want to do that!How to set timing:For every 50 hp in Nitrous you add to a motor,you must retard timing by 1-1/2 to 2 degrees in order not to damage parts. For a 150 hp kit,you would take 4-1/2 to 6 degrees of timing out. Since taking timing out when the car is not using Nitrous hurts power,you can either move the timing maually every time,or buy an ignition system that is controlable from inside the car when you want to. What is the difference between a 1 stage and a 2-stage system? A: A single stage system refers to one single nitrous system; a 2 stage or dual stage incorporates two nitrous systems on one application. This allows a car to launch with the maximum horsepower possible, with the traction available, then add more power down track as the car will handle it. A: A nitrous purge kit clears the delivery lines of unwanted air and vapor and guarantees immediate power from your nitrous system. Nitrous Bottle Heaters or Warmers are the way to get the most consistant accurate hit of nitrous every single time. Bottle pressure is very important to nitrous performance you want it to be maintained between 950-1100psi. Forget about trying to heat your bottle any other way and risk damaging your bottle and physicial harm! These kits are the easiest and most reliable way!! You can go with the basic heater and turn it on and off yourself with a toggle switch, or get the amazing fully automatic Heater kit that is complete with everything you need including heater, wiring, relay, adapter, and the bottle pressure switch! The bottle pressure switch is fully adjustable and watched the bottle pressure. When it gets below a certain pressure it turns the heater on, and when it gets too high it turns the bottle heater off. You can't get more simple than that, comes preset to maintain 1100 psi, but is adjustable! Can I use nitrous with a regular Hondata reflash? A: these programs will probably not be suitable due to the aggressive ignition advance used. If you want to use nitrous and this program now, you must install a nitrous system that retards ignition. Does the Hondata K-Pro work with Nitrous? A: Yes.There is an entire control panel for nitrous operation, and Hondata can back it up with extensive nitrous testing in their own cars. The K-Pro switches on nitrous based on rpm, throttle position, vehicle speed, and air pressure. It also switches off nitrous before the fuel cut-off. Can i use Hondata FlashPro to tune nitrous? A: No. However, you can at least control the ignition timing to make nitrous safer. [better then nothing]. You will need a window switch to be on the safe side. Will Hondata FlashPro come out with nitrous tune? How can nitrous blow my engine up? Why doesn't everyone use nitrous? A: Nitrous is not for everyone, some people prefer turbos, some like blowers, and others feel it is cheating to use nitrous. Don't be afraid of Nitrous. Properly used,it is great. Abuse it and you will be walking home with a blown motor. Learn all that you can before getting a kit. these are the information that help me understand about nitrous and many people have ask the same question over and over on every forum i been on. hopefully this thread will be clean with information only and guild lines as what people need to know before posting.. i will provide parts number and nitrous brand kit to give people more option on the table ..
Last edited by ISprayNosFg2; 09-15-2011 at 03:06 PM. Hey man. I just read the article. I've been interested in nitrous for years and even had a direct port kit but didn't know enough about it to install in my daily so I sold it . But more ive been having the urge to add it to my setup. What do you think? Last edited by BoostedK20; 07-06-2014 at 11:11 PM. I was thinking about NO2 but I was looking at the one that cools down the intake pipes for the intercooler. Not the spray that sprays the actually IC. You could use that cryO2 for that right? Correct I know DEI or cry02 makes a kit. Also a fuel cooler too.